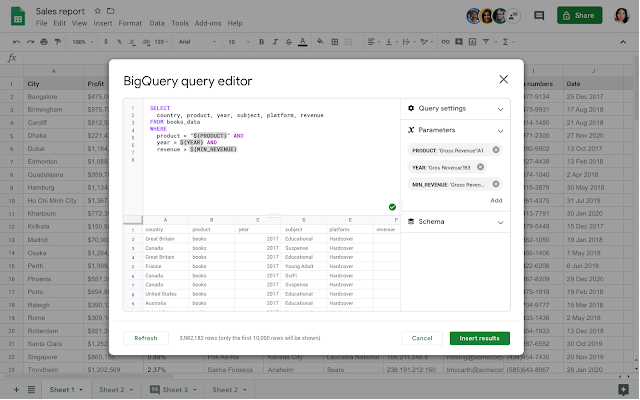 We built BigQuery to help analysts make sense of large datasets—now it’s easier for employees and team members outside of data analyst functions to access and analyze data. By bringing these two tools together, collaborators and other stakeholders can view up to 10,000 rows of data from BigQuery in an easy, familiar interface. This makes collaboration and insight sharing easier, enabling faster decision making. To check key permissions for the BigQuery data connector see here. Anyone you share the spreadsheet with will see the data contained in the sheet. Only those with edit access in Sheets and view access to the BigQuery table have the ability to refresh the dataset. As always, use share permissions to control who can view, edit or share your data. In the coming weeks, you’ll be able to use tools like Apps Script and the macro recorder to schedule automatic updates within Sheets to the connected BigQuery data. For example, you can automatically refresh sales data in your spreadsheet so the data is fresh and ready for analysis at the beginning of the day. To learn more about how to record or run macros in Sheets, check out this G Suite Pro Tip. Rapid Release domains: Extended rollout (potentially longer than 15 days for feature visibility) starting on January 15, 2019. Scheduled Release domains: Extended rollout (potentially longer than 15 days for feature visibility) starting on January 29 2019. Not available to G Suite Basic and G Suite for Nonprofits.